Ventriculoperitoneal shunt remains one of the most common surgical forms of treatment for hydrocephalus. Many patients will eventually require a shunt revision for malfunction and recurrent hydrocephalus. For abdominal complications of ventriculoperitoneal shunts, laparoscopic techniques have been reported to be successful for shunt repositioning. We describe our recent experience at one institution in a series of adolescent patients. Two patients aged 14 and 17 presented with mental status changes secondary to hydrocephalus and radiologic evidence of a malfunctioning ventriculoperitoneal shunt. Accessing the reservoir determined there was no proximal obstruction and a shunt series of plain x-rays confirmed there was no distal kinking. Abdominal ultrasound confirmed large cystic fluid collections surrounding the intra-abdominal catheter. In conjunction with general surgery and the neurosurgery team, an exploratory laparoscopy was planned. A 10mm balloon tipped trocar was placed in the LUQ and conventional 15mmHg insufflation was initiated. Two additional 5mm ports were placed in each case for instrumentation, followed by a brief lysis of adhesions. 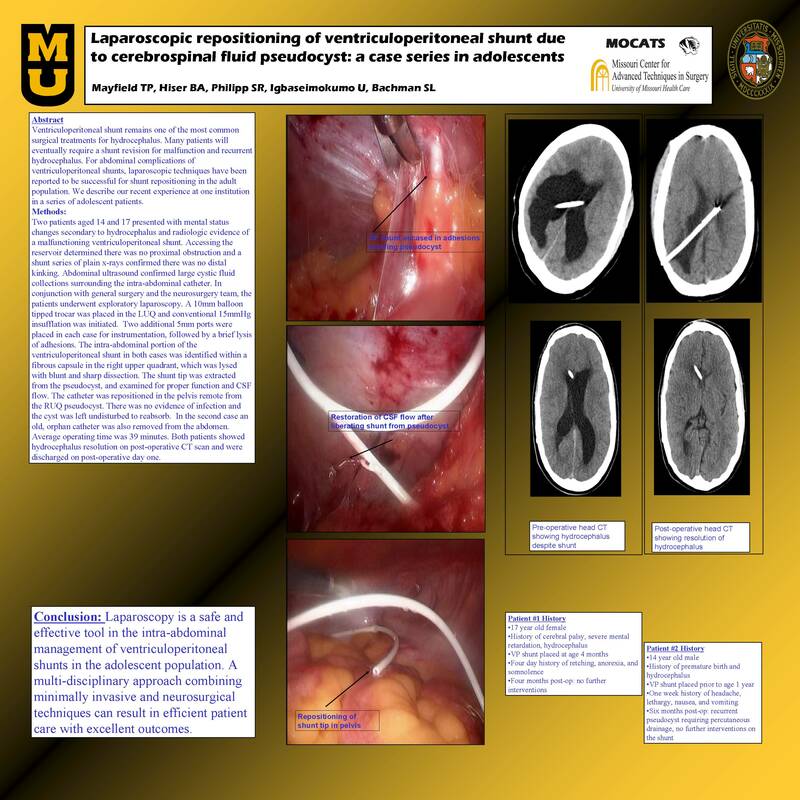 The intra-abdominal portion of the ventriculoperitoneal shunt in both cases was identified within a fibrous capsule in the right upper quadrant, which was lysed with blunt and sharp dissection. The shunt tip was gently extracted from the pseudocyst, and examined for proper function and CSF flow. The catheter was then repositioned in the pelvis well away from the RUQ pseudocyst. There was no evidence of infection and the cyst was left undisturbed to resorb. In the second case an old, orphan catheter was also removed from the abdomen. Average operating time was 39 minutes. Both patients showed hydrocephalus resolution on post-operative CT scan and were discharged on post-operative day one. Laparoscopic techniques are safe and highly effective means of managing intra-abdominal complications from ventriculoperitoneal shunts. A standardized multi-disciplinary approach may combine efficient service and excellent patient care.